At the core of every valuation or risk model is a pricing model. Somewhat surprisingly, it is not uncommon for complex exposures of an asset or portfolio to be analysed using a single or small number of deterministic price scenarios. Such an approach overlooks a key aspect of the problem being analysed: commodity prices are uncertain. Understanding how an asset or portfolio performs given price uncertainty is critical to understanding value and risk..
At the core of every valuation or risk model is a pricing model. The pricing model describes the behaviour of commodity prices that are used to analyse the interaction of an asset, contract or portfolio with the underlying markets. Developing an effective pricing model is therefore key to any analysis of an asset’s value, risk, optimisation and hedging. For example, it is the driver behind measurement of the worst case loss from a portfolio’s exposures (e.g. Value at Risk) or the analysis of a power plant’s dispatch decisions. Somewhat surprisingly, it is not uncommon for complex exposures of an asset or portfolio to be analysed using a single or small number of deterministic price scenarios. Such an approach overlooks a key aspect of the problem being analysed: commodity prices are uncertain. Understanding how an asset or portfolio performs given price uncertainty is critical to understanding value and risk. Often commercial decision makers place less weight on the results from valuation and risk models as they do not understand how value can be monetised or risk reduced. However, specific hedging and optimisation strategies exist to extract value from an understanding of price uncertainty. Much like Traders and their cars, some Quantitative Analysts believe that having the most complex and sophisticated pricing model offers up bragging rights. However, increasing levels of model complexity will in most cases offer diminishing marginal (and often negative) value and insight. For example, it becomes increasingly difficult to estimate parameters and validate model assumptions without significantly increasing the risks of the model missing the key price characteristics that it is trying to capture. More importantly complexity reduces the chance of explaining the results to commercial decision makers and challenges the trust they place in the results. Often simplicity, or the application of the clichéd 80:20 rule, yields a more successful outcome. Real value comes not from being able to build the most complex model but from the skill of knowing which model is most appropriate and how to effectively apply it. There are many ways to describe pricing models. For example: spot versus forward price models; single versus multifactor; applied through simulation versus probabilistic density functions and so on. When describing models the number of “factors” generally refers to the number of random normal variables used to model price movements. As mentioned in a recent post on currency risk, it is important that consideration be given to all the risk factors that impact the risk and value of an asset or portfolio. For example, the recently commissioned BritNed power interconnector between the United Kingdom and the Netherlands has an exposure both to the UK and Dutch power prices but also to the EUR-GBP exchange rate. As such, it’s important that the correlation between these different risk factors is explicitly considered. This is the case in the two most commonly used stochastic price modelling approaches described below. A “jump” process can be included to capture the tendency of power and gas prices to move away from their long term equilibrium for short periods in response to supply shocks. Additional factors can be added to allow other key price relationships to vary; the most common is to add a factor to allow the long term long term equilibrium price level to drift (as proposed by Schwartz, 2000) or an additional factor can be added to allow the seasonal shape to vary. An advantage of this class of models is that the term structure of volatility can be derived from the key input parameters, volatility and mean reversion. This allows forward price movements to be derived from movements in the spot price which allows the evolution of forward prices through to spot to be simulated in a consistent manner. A sample simulation for the UK gas market is shown below in chart 1. 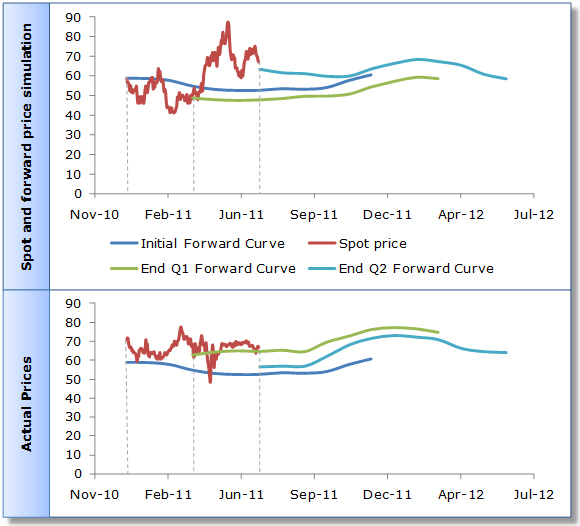 Chart 1: Sample simulation of spot and forward price against actual prices. Source: Timera Energy Price Model, ICE NBP futures and APX SAP prices. The chart illustrates how the forward curve can be derived from the spot price simulation thereby consistently modelling the evolution of prices through to delivery. The equivalent outturn prices are shown as a point of comparison. The other commonly used class of pricing models are multifactor forward price models. Here a series of volatility functions are used to describe different types of movements in the forward curve. An example is shown in Chart 2 below. Chart 2: Multifactor pricing model volatility functions. Additional volatility functions can be added to describe more complex forward curve movements but these will offer decreasing incremental value in explaining the variability in forward curve movements. At each time step, each independent volatility function is simulated and then aggregated to show the movements in the forward curve. A major advantage of the multifactor models are they allow the shape of the forward curve to change over time which can be important for assets or portfolios with time dependent optionality. For example, even if the expected profile of gas storage injection or withdrawals is fully hedged, changes in the shape of the forward curve may create situations where it is profitable to unwind the original hedges and re-optimise and hedge against the new shape (this is known as a rolling intrinsic strategy). As with single factor models, multifactor models also allow a consistent treatment across forward and spot prices. The first is important as it allows the market expectation of future price behaviour (most notably volatility) to be incorporated. The second is important as it allows commercial decision makers to better understand the model assumptions and results. This increases decision maker’s confidence in the model and therefore the weight they place on the results. Single factor models have an advantage here. The parameters can be directly estimated from historical data or adjusted to fit a desired term structure of volatility lifted directly from observable ‘At The Money’ implied volatilities. Whereas parameters for multifactor models can really only be derived from performing a Principle Component Analysis (PCA) on historical forward price movements. PCA is a technique that looks to explain the variability in multivariate data by constructing a series of independent functions. Commercial decision makers will find it easier to associate with volatility and term structure than complex volatility functions. Value is created and lost through the dynamic interaction between changing market conditions and assets or portfolios. As such, analysis of value and risk that does not explicitly consider uncertainty in commodity prices offers limited insight. There are a range of techniques of varying degrees of complexity that allow the key dynamics of commodity prices to be modelled, such as the relationship between spot and forward prices and the correlation between risk factors. However the key to extracting real commercial insight from pricing models is effective application, primarily through choice of model methodology and parameter estimation. Transparency and simplicity help build the commercial decision maker’s understanding and trust they place in the model results. But ultimately effective application is achieved through a strong commercial understanding of the markets and assets to which the pricing models are applied. This article is the first in a series focused on analytical methodologies for valuation and risk in energy markets. Next week we explore the impact of the recent Electricity Market Reform policy announcement on the UK power market.